Head into battle with Angry Birds Epic. Rovio Entertainment, the company behind Angry Birds Go and Angry Birds Star Wars 2 returns with Angry Bird Epic. 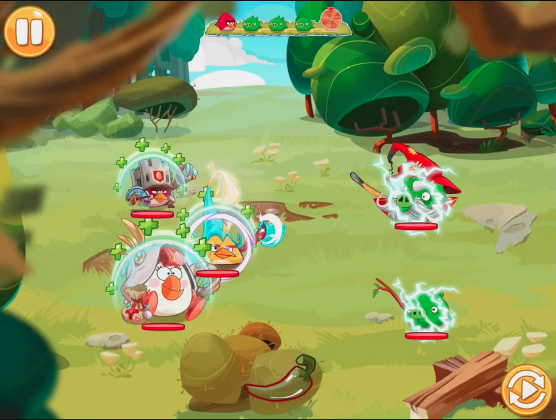 This is Rovio's first RPG featuring the iconic Angry Birds characters as legendary heroes. In this epic adventure, you explore a fantasy version of Piggy Island full of mysterious caves, tropical beaches, frosty mountains and loads of other exciting locations. Stop King Pig, Wiz Pig and Prince Porky from scrambling your eggs. On that note, we'll help you get started with a few tips and strategies. How do I play Angry Birds Epic? Angry Bird Epic is a turn based RPG. To engage enemies, you must tap your bird and swipe to your target. Releasing a finger from the screen initiates your attack while ending your turn, letting the pigs attack next. Each Bird has a secondary move; tap your bird and hold to activate it. Deal enough damage to get your chili rage meter up. Once the chili rage meter is full, unleash a powerful attack on your opponents by dragging the chili to your bird. After each round, you get a star rating on how well you did on that level. Three stars signifies a triumphant victory over your adversaries and rewards you with three chances to win more loot. Get three stars by quickly defeating the pigs with little damage to our feathered friends. Anything less means you either took too much damage or the fight went on too long. How do I craft items in Angry Birds Epic? Once you reclaim your Magic Anvil from Prince Porky's thugs, you can forge weapons and items. It's time to power up your birds with some cool new weapons and off-handed items to turn these pigs into bacon. Ingredients collected from your previous battles will allow you to craft items. Each weapon and off-hand item requires a blueprint and a specific amount of ingredients for crafting. If you're missing a few ingredients, replay levels that reward your victory with a chance to gain these items. Once you have enough ingredients, craft until your heart's content. How do I craft strong items in Angry Birds Epic? Crafting stronger items really depends on luck. When crafting items, you roll the dice to determine the strength of each item; the more stars on the die, the stronger the weapon. You can re-roll the die with a Friendship Essence in the hopes that you get more stars. Keep in mind that the last roll will determine the strength of your weapon. As you progress through the game and level up, you unlock more ingredients for stronger weapons. How do items effect birds in Angry Birds Epic? Weapons increase a bird's attack power, and thus the damage dealt by all of their skills. The skills vary from bird to bird, increasing various abilities like attack power, vigor, defenses and enemy effects. Off-hand items increase a bird's health and secondary abilities. Secondary abilities can offer character buffs to a single bird or multiple birds within your party. Combine weapons and off-hand items to develop powerful strategies against tougher enemies. Each item will effect enemies differently, either aiding or hindering your ability to beat levels quickly with minimal damage. How do I craft magic items in Angry Birds Epic? The Magic Anvil isn't the only thing stolen from your nest. Prince Porky's thugs also made away with your Magic Cauldron. Use the cauldron to create items to replenish your bird's health and chili rage meter. The Magic Cauldron works the same way as the Magic Anvil, with the exception that items created from ingredients don't stay with your bird once used. Create items like the Experience Potion that doubles XP for one battle, or Mighty Eagle's Favorite Dish, which defeats all pigs on the screen. As you progress through the game and level up, you unlock more ingredients for different magic items. Can I play with friends in Angry Birds Epic? You can't play directly with your friends in the game. You can get friends to help you unlock paths and share Friends Essence, which allows you to re-roll on items created. Sign in with your FaceBook account to recruit friends to help you on your adventure. Check out their nest and eventually recruit their birds to help you against an enemy you're having a hard time with. Do I need to pay for anything in Angry Birds Epic? Angry Birds Epic is free-to-play with micro-transactions for Lucky coins, Snoutlings and Essence of Friendship. Check out our guide on how to get more Lucky coins, Snoutlings and Essence of Friendship. You can share your game progress across multiple devices with a Rovio Account to take your adventure on the go. You should now have the fundamentals of playing Angry Birds Epic from attacking, crafting weapons and items to playing with friends. Don't let your eggs get scrambled and remember to like us on Facebook, so we can team up to stop King Pig. If you have any tips and strategies that we overlooked feel free to comment below.